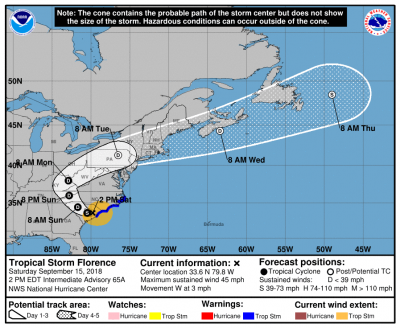 Hurricane Florence - Final Update | Match Factors, Inc. Match Factors will open at normal hours on Monday. Hurricane Florence made landfall yesterday morning just above the SC/NC border as a Category 1 hurricane. Fortunately, we avoided the brunt of the disaster as the hurricane stalled and deteriorated before impacting our area. Aside from some downed trees, our office did not experience any power outage, flooding or major damage. We know others, especially those in the coastal region, were not so fortunate. Please note that we will open at normal hours on Monday, September 17, 2018, and we expect no further interruption to our office schedule as a result of this storm. We sincerely appreciate your thoughts and prayers as we prepared and weathered Hurricane Florence. Your cooperation and well-wishes meant everything to us. And for those clients in the affected area, please know that we are here to help. on Saturday, 15 September 2018.